This morning I received a tweet from the @LongmirePosse with a link to sign a petition: longmire.epetitions.net (you should copy the link and paste it into a new browser window if you want to sign the petition). I of course, quickly went there to sign the petition because I, of course, have been and will continue to be a big fan of both the series and the books (written by Craig Johnson). I myself have been a little vocal about A&E stomping all over the specific demographic that I myself are located in (55+). It’s no secret that A&E wants to distance themselves from the baby boomers even though Nielsen, AARP and several others continue to release tons of data that, in a nutshell, state that the (Nielson) 50-plus market that many advertisers ignore (or insult) is not big: IT IS ENORMOUS. 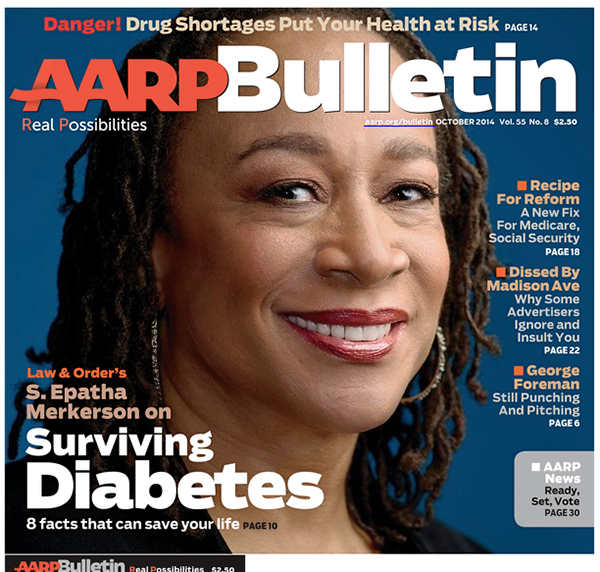 David Wallis wrote a great article that’s published in the newest AARP Bulletin entitled “Selling Us Short.” The deck of the article says: People 50+ have bucks, but advertisers don’t seem to care. In this article he talks about advertisers that are either ignoring us, or insulting us. Take Esurance as an example and that extremely idiotic commercial starring Beatrice who tapes her recent vacation pictures to her “wall” and unfriends her friend (literally) or the woman who plays candy crush with actual candy using a hammer on her dining room table (3-in-a-row, level 2). I’m not into rolling my eyes at stupid, insulting commercials. I just hit the 30-second fast-forward button on my DirecTV DVR remote and zap it into outer space. No thanks Esurance, I’ll stick with my cute gecko telling jokes on the ferry. Signing the petition isn’t just registering your vote to get a quality show like Longmire back on television. It’s also exercising your right as a 55+ demographic that many networks don’t take seriously. The same Nielsen study found that the 50-plus market many advertisers ignore (or insult) will control 70% of the country’s disposable income by 2017. Nearly 60% of homeowners over 65 are no longer weighed down by a mortgage compared with just 11% of 35-44 year olds. Baby boomers account for 80% of America’s luxury travel spending. And here’s a fact for Esurance – consumers over 50 buy nearly five times as many new cars (which require insurance) than does that prized 18-34 demographic. Now armed with those facts and figures, mosey on over to that petition signing site and exercise your rights. And if you have insurance with Esurance, and you’re a baby boomer, consider cancelling and going with someone who doesn’t insult your intelligence with stupid commercials. Amen to that! Long Live Longmire! Laurie Holden Talks to TV Guide; Variety on The Walking Dead vs. Downton Abbey – The Walking Dead – AMC. As I was watching the Walking Dead marathon yesterday during the Super Bowl, I realized just how far our band of survivors has come. It’s always good to be able to see the beginning and then reflect what shapes characters. Take for instance Laurie Holden (Andrea) losing her sister (Amy) and then, when she wants to leave her misery and pain behind her, Dale won’t let her (in the last episode (TS-19) of Season 1). I also realized that Glenn got kidnapped in the first season by the homies in the episode “Vatos,” which is actually one of my favorites. “Vatos” is the episode where Rick, T-Dog, Daryl and Glenn return to Atlanta to retrieve Merle and the bag of guns Rick dropped when he was taken down by the gang of walkers. It turns out that for all the machismo they’re showing, the homies are just trying to keep a well hidden assisted living center running. Guillermo (Neil Brown, Jr.) was the custodian and is elevated to “leader.” He uses one street credit line in there that’s hysterical, claiming he’ll feed “Glenn to his dogs that he stole from Satan’s backyard.” The dogs turn out to be 3 toy chihuahuas. This episode (Vatos) attained general acclaim from the TV critics because it successfully made the viewers experience the daily life of the show’s characters. Upon initial airing it attained 4.75 million viewers according to Nielsen. It became the highest-rated cable program of the day and the ninth most-watched cable program of the week. Now click on the link above and read all the interesting things about the Walking Dead which returns with new episodes this Sunday. Set your DVRs.